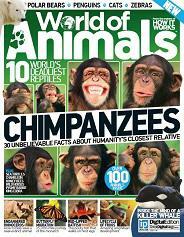 译术论坛杂志期刊书籍资料库World of Animals Issue 6-2014 UK100 Pages|True PDF|English|17 MB A journey into nature like no other,World Of Animals allows its audience to lear ...animals,动物,magazine,杂志World of Animals Issue 6-2014 UK - Powered by Discuz! A journey into nature like no other, World Of Animals allows its audience to learn the secrets to Earth’s weird and wonderful wildlife, offering a rich and wholesome educational experience. With spectacular photos, stunning diagrams and captivating features, World Of Animals provides a rare opportunity for people of all ages to enjoy their favourite creatures in a whole new way. It’s a brand that connects with audiences across the world and across media as a celebration of one of the most enduring and beloved topics. GMT+8, 2019-4-20 05:08 , Processed in 0.476812 second(s), 40 queries .